An Open Letter to Dana Larsen, Jodie Emery, and the organizers of the 4/20 movement from the Chair of the Q Hall of Fame Canada. First, please know that your actions to create a social movement are applauded. These social movements are often the foundation behind many of the advancements in society and are an important part of our Canadian heritage. Today is April 24, 2018, exactly 4 days since the 4/20 events that occurred in cities across the country. Since that day there has been much debate about the importance of the 4/20 with the impending legalization of marijuana by the federal government. Some have argued that the 4/20 events will not longer be necessary, others have presented an opposing view. This is all very fair and our ability to debate is an integral part of the freedom we experience in this amazing country. We have seen many arguments from the pro 4/20 side that has equated these events with the Pride events that occur in many cities across Canada and around the world. We have seen this comparison from organizers and event attendees in defense of the plan to continue the 4/20 events after legalization. This includes comments made by Dana Larsen and Jodie Emery. What we want to discuss today is centered around your clear misunderstanding of the Pride movement and the significance that it has for people around the world. The Pride movement was born of the direct and state sanctioned discrimination of people because of their sexual orientation. This discrimination included imprisonment, sanctioned violence, loss of employment, loss of homes, forced hospitalization, and much worse. This all happened because people were born outside of what was deemed a societal norm, it was not a choice that was made. The 4/20 movement was born of a desire to be able to partake in the ingestion of a substance. Yes, it is true that people are jailed, have lost their jobs, and in some cases their homes because of their use of Marijuana. You are not however born with an inherent, physical need to ingest marijuana. The difference is stark, regardless of what some may claim. Marijuana and the ingestion of it is made by personal choice, people actively make the decision and are presumably aware of the consequences. Being L, G, B, T, T, Q, Q, 2, A, A, I, P – is not choice, we are born this way. People who identify as LGBTQ+ are discriminated against not because of a choice that they made, it is because they were born. In the past six decades the once ‘Gay Rights’ movement has grown to become a rich and diverse community that includes many in the broad spectrum that is the LGBTQ+ community. It is about diversity, equality, and the fundamental human right to exist. There have been statements made by some that because gay marriage has been legalized, or because of the other many advancements in the LGBTQ+ community Pride is no longer necessary. While it may be true that to be able to someday state that Pride is no longer necessary would be a beautiful thing, we are not there yet. We are far from that day, and until there is true equality for all – we will remain far from it. Not only do members from the LGBTQ+ community in Canada still experience discrimination, but around the world there are places that exist where being “caught” as LGBTQ+ is punishable by imprisonment and even death. Yes, we have won significant rights in Canada, but we are still far from the dream of complete equality for all members of our community. The continuation of the Pride events in Canada is not just about Canada. It is about demonstrating to those people who still suffer under the yoke of oppression that there is hope. It is about the continued galvanization of a community who, even with legal protections, is one that still experiences high levels of hate crimes. When you attempt to hitch the 4/20 movement on the tails of a movement, like Pride, you do a great disservice to the pioneers of our community. The people who have spent decades fighting for basic recognition as human beings under the law. The people who were jailed, beaten, given shock therapy, lobotomy’s, and in too many cases murdered simply because they wanted to be treated like people and not animals, or deviants. Your claims that the 4/20 movement is the same as, or is as important as, the Pride movement dishonours our pioneers, the activists, and the achievements they fought so hard for. You also diminish the very real struggle of people around the world who still live in daily fear, not for a choice that they made, but for being born. People like those in Chechnya that are rounded up and put into “concentration camps”, or the youth who are forced to go to conversion therapy camps by their families, or the Transgender members of our community that even in Canada experience abuses. The list, sadly, goes on and on. 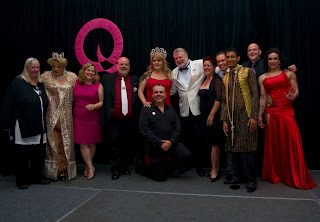 As the Chair and Founder of the Q Hall of Fame Canada I have had the immense pleasure of better understanding the history of our diverse and vibrant LGBTQ+ community. I have met many of the pioneers who fought so hard for the basic freedoms we have today, and who continue to fight for others who do not. It is understood that the 4/20 movement is important to you, and countless others. It is not our intent to minimize the efforts you have made. It is however our intent to draw a clear distinction between the 4/20 and Pride movements. One is about a plant and the ability to ingest it. The other is about the basic, fundamental, human right to exist. All Rights Reserved - P.J.T.. Simple theme. Theme images by imacon. Powered by Blogger.